ABOVE: Cavete is a Kneipe or bistro in the lively Kuhviertel. The last time we checked, the local restaurant and nightlife guide--Münster Geht Aus--was 212 pages thick and listed restaurants in more than 30 categories, from Afrikanish to Vietnamesisch. If you're looking for regional cuisine, you'll be pleased to know that the Deutsche Küche section lists more than 80 restaurants. For tasty, filling Westphalian cuisine in an historic setting, try the Altes Gasthaus Leve on Alter Steinweg 37. 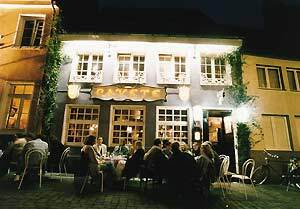 The restaurant, which is said to be Münster's oldest Gaststätte, traces its roots to 1607. The menu is extensive, and prices are reasonable, and the restaurant is loaded with traditional German atmosphere. In the Hafen or harbor district, you'll find the Kreativkai and assorted restaurants, bars, and beer gardens overlooking the Dortmund-Ems Canal. For more information on food, drink, and nightlife in Münster, see the translated listings at münster-geht-aus.de or buy a copy of Münster Geht Aus at the tourist office.